Right now there are half a dozen Byron McLaughlin autographs on eBay, none of which look alike. The completed sales tell a story. A couple are glossy photos, a couple baseball cards, and a couple just yellowed index cards. One is subtitled “#27,” another “#30,” the reality of an athlete on the edge of the roster. Sometimes the signature is looping, other times harsh and angular, signed at different times in different moods. One, on his tri-paneled rookie card, covers his entire face. They all share one thing in common: each sells for at least a hundred dollars. There aren’t many Byron McLaughlin autographs out there, and there won’t be any more soon. McLaughlin’s story starts out reasonably common. Undrafted out of high school, he forsook both higher education and the draft, signing with the Expos as a position player and playing a mere seven games before getting cut. The Orioles tried converting him to pitcher, but after a single season of ugly middle relief they, too, gave up on him. He spent a year in independent ball before the vacuum of expansion drew him back and transformed his life. The Seattle Mariners had plenty of chances to take, so they signed him and loaned him to Nuevo Laredo in the Mexican league for little cost and no risk. It paid off. When the Mexican season ended in September, McLaughlin found himself in the major leagues, only 21 years old. Most 21-year-olds make the majors because they’re elite prospects; McLaughlin was a live arm on an expansion team. 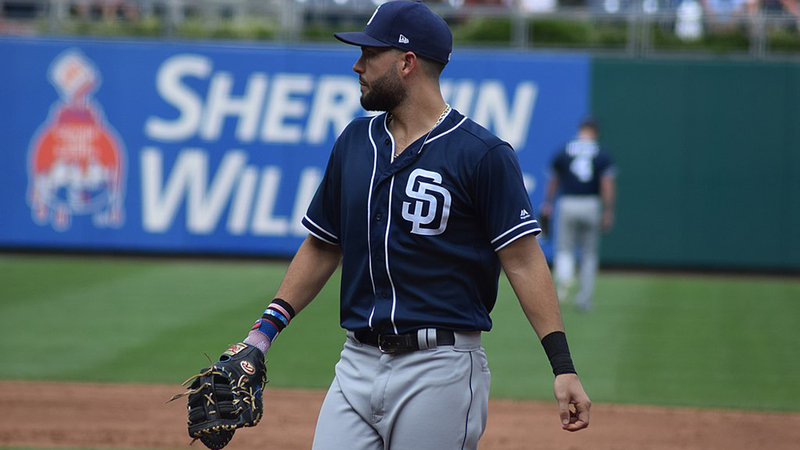 He spent the next couple of years just good enough to stick around at the major league level, shuffling between the rotation and the bullpen, putting up an ERA in the low fours, riding the shuttle back and forth to Triple-A. The stuff was there: his rookie season he was fifth among starters in strikeout percentage. But character questions dogged him, and fed into a cycle of negativity. He asked the team trainer to fly his bags on a road trip while he took leave to get married; he neglected to tell him about the handgun that was caught by security and forced the confused man to miss his flight. McLaughlin also cut his hand pitching in front of a mirror to examine his mechanics, standing too close and breaking it. It was the typical behavior of a 21-year-old, but at some point, McLaughlin was no longer 21. Eventually the Mariners improved, and McLaughlin’s arm and health decayed, and soon he found himself back in Mexico, pitching for paychecks. McLaughlin said he blamed “everyone,” including Angels manager John McNamara. ‘They pitched me 22 innings in eight days [note: 21 innings in 10 days], and an arm can only take so much. I never said no, but I still blame them all. I was hurt because of the way they used me. McLaughlin was not grateful, but he also did not quit. Two weeks later, when the rosters expanded for September, he came back and pitched five games of long relief in losses. 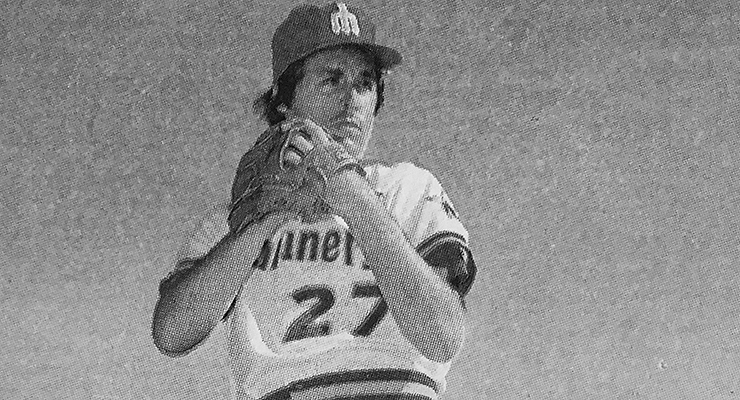 On Sept. 28, 1983, he was given one last start. He gave up a single run and won his final game in the major leagues. He finished at 16-25, with a 5.17 ERA. Now an indisputable clubhouse cancer, he found no invitations to 1984 spring training. Instead, he returned to Mexico, to his old team in Nuevo Laredo, waiting for another break to go his way. It didn’t, on the mound. But as one career was reaching its end, his second one was just underway. Byron McLaughlin, former Angel pitcher who failed to appear at an arraignment on a charge of conspiring to possess and sell cocaine, may have fled to Mexico, police said Friday. A bench warrant for his arrest was issued Tuesday and bail was increased to $250,000 from $25,000, police said. McLaughlin was arrested Sept. 17 after an undercover policewoman alleged he tried to sell her 11 ounces of cocaine for $24,000, but was released on his own recognizance when he agreed to work with police in an operation to identify and arrest his supplier, and was to meet with officers the next day. It was the first of many instances of the former pitcher’s words proving more profitable than his deeds. But there is no follow-up to the story, no arrest, no perfunctory afternoon trial. The charges were quietly dropped and McLaughlin returned to his former life, untouched. It’s alleged that his mother, wealthy and connected, bribed a local politician into dropping the charges; whether this is true, what we do know is that McLaughlin was back in San Diego before long, having paid little for a valuable lesson: that drugs are a risky business. Free from the watchful eyes of probation officers, McLaughlin delved further into the study of alchemy, making money out of nothing. He kited checks and then credit card transfers, intentionally overdrawing funds and then getting accounts closed before the overdraw charges rolled in. In the pre-internet age, and with his charisma, it was surprisingly easy for him to jump from one opportunity, and one scam, to the next. It was at this time, living in San Diego, that he first encountered a stranger named David Cameron. Cameron was an autograph collector, seeking to complete entire sets of baseball cards with autographs. For a man with such ambitions, McLaughlin was buried treasure: a man whose value was tied not to his fame, but his obscurity. The autograph hound tracked down McLaughlin and began to ask him for a meeting, something the petty criminal was obviously disturbed by. But eventually, the one man wore down the other and Cameron got not only McLaughlin’s signature but, impressing him with his tenacity, earned odd jobs as an assistant. It was a simple enough job, and it seemed innocent enough. Cameron cemented the deal, shook hands, and headed home. After all, there were times when the flow of business happened to run completely on the right side of the law. McLaughlin’s connections had once led him to a butcher with a cash flow problem and a freezer full of meat. McLaughlin took the meat on consignment, traveled to poor neighborhoods, selling and sometimes bartering for TVs and stereos, before finally paying his supplier back. After Cameron returned stateside, the trip faded into memory and it was back to business. By the time Cameron and McLaughlin parted ways in 1988, it appeared that the shoe affair was just another small-time transaction, another day staying afloat. Counterfeiting, as a vocation, is as old as the first bill of sale. The word still conjures images of fake hundred dollar bills made of waxy paper. But the modern, global world of counterfeiting goods only began a few decades ago, as corporations became international and their names took on value of their own. Unlike any era before it, the 80s were a decade devoted to brand culture: designer Jordache jeans, Swatch watches, and more than anything else, shoes. But even less than today, international government was unequipped to deal with international finance, and trademark legislation was almost completely ignored. Except by one man: Harley I. Lewin. Lewin opened up a solo law firm in 1979 with one purpose: to protect trademarks. It began with bootleg T-shirts of touring musical groups, until they noticed that while the salesmen changed from city to city, the shirts were the same. Lewin applied for and received the precedent to seize counterfeit goods, and thus began a long game: counterfeiter and corporation, each trying to get one step ahead of each other. Eventually a small British shoe company complained about the same con, but on a bigger scale. That company was Reebok. Over the years Reebok and Lewin’s trade expanded in tandem; sales of the footwear company exploded as the fitness craze of the ’80s took hold, and Lewin hired a team of investigators to sniff out criminal operations. And as the profits grew, so grew the need for legislation, as trademark infringement grew increasingly defined. In 1980, the Nike “swoosh” would have been just a decoration; the name of the company needed to be present. But over time symbols grew to be accepted as part of a company’s identity and reputation. Lewin worked with Ted Kennedy to get the legislation passed to arrest counterfeiters, and began to set up sting operations, having his field operators pose as buyers. And in Mexico he had one particular target: the man they called Byron de Tenis. McLaughlin’s enterprise, shipping shoes to Mexico, adding the logos of popular brands, and selling them on the streets and in self-run storefronts, was a major success. In a matter of years, his lifestyle had completely transformed. He no longer had to run from the creditors. Instead he’d settled into a lavish home in the San Diego suburb of Coronado, with a family, a luxury car and a backyard pool. Each day after breakfast he got in the car and made his usual half-hour commute: across the border into Mexico, to oversee his wildly successful footwear business. From there he managed a widespread operation: Korean-made shoes floating into random ports, where he bought them for ten dollars a pair and sold them, either independently by hand or through other enterprising distributors at his warehouse, for double the price. Along with managing the flow of goods and cash, he was also bribing customs officials and local law enforcement, greasing the wheels of the production line. He accepted U.S. currency only, which he converted into that perfect symbol of ’80s wealth: traveler’s checks. He lugged the checks back home to Coronado and deposited them at the local bank, until the process grew so unwieldy he turned to Luxembourg for his financial services. McLaughlin’s retirement fund had reached $2.4 million, in fact, before it all fell apart. A routine shipment across the border at Nogales, Ariz., caught a customs agent’s eye, and suddenly 40 cartons of counterfeit sneakers were tied to McLaughlin, to his canceled traveler’s checks, to his front company in Chula Vista and his Korean distributors. Lewin flew in to plan the sting, netting 16 conspirators, including McLaughlin’s brother, Glenn, who had begun forming a side operation in Chile. McLaughlin himself was arrested at his home. Another career had come to a close. This should be where the story ends. But just as with his pitching, McLaughlin’s life of crime is best encapsulated by indefatigability. Released on bail, his pockets empty and his assets seized, the man did what he did best: made do. He and his lawyers hurled motions to delay the trial, arguing hopelessly that he couldn’t break American law on Mexican soil, kiting his own freedom. Meanwhile, Lewin and the DA kept on the offensive, suing and charging him simultaneously. Finally he pleaded guilty to money laundering and agreed to pay back the $2.4 million he’d stolen. Four days before his sentencing, however, he was gone again. McLaughlin made his familiar commute, driving to Tijuana, but then adding one extra side trip, he flew to join his French national wife and child in Cannes. The story at this point nears apocrypha: there is a story that he was arrested in the Ivory Coast, and captured by local officials, but was able to buy his freedom with a gold Rolex. (The authenticity of the watch will forever remain a mystery.) The United States sentenced him to 14 years in prison in absentia, and attempted to extradite him, only to be rebuffed by the French government. Having married a French national, he was considered a citizen in good standing, and he was out of reach. Lewin and Reebok turned to Banque Internationale a Luxembourg (BIL), seeking to wrest back their lost profits. But McLaughlin was once again a step ahead: during his original arrest, he called his wife and walked her through the process of syphoning the funds to a second and then a third hidden, shared account. Reebok sued the bank for mobilizing the supposedly frozen assets, and after years of appeals finally won the argument, only to have the U.S. courts decide that BIL was ultimately outside their jurisdiction. The hope was that by suing BIL, it would force the foreign entity to in turn pressure McLaughlin into returning the money. Like every attempt to collar McLaughlin, he narrowly escaped. Lewin met the counterfeiter one last time, in Paris. The meeting took place after McLaughlin’s wife had contacted them, offering to assist the lawyer in his pursuit; when he saw her, she was badly beaten. When he inquired, she admitted that she’d told the former athlete about their prospective meeting. Still, they met. Undeterred and unembarrassed, McLaughlin asked Lewin for a bargain, asked for money, offered nothing. He didn’t even mention his brother Glenn, who spent a year in a Chilean jail. McLaughlin, Lewin says, was calm and charming; he rarely raised his voice, was gracious. He was also clearly a sociopath. His story was ultimately no different than when he’d been cut by the Angels, decades earlier: He was persecuted, he was misunderstood, everything was always someone else’s fault. He couldn’t understand why people were out to get him, why he couldn’t just win. Ultimately, there was no deal. His wife left him, and he in turn left Cannes. And there, the trail grows cold. Based on whispers, Lewin suspects that McLaughlin took his smuggling arts to southeast Asia, to open a new location for his unfailing business of making himself money. He certainly always needed money. Or maybe he went back to the Ivory Coast. Cameron believes he might be in Mexico, the land he loved most. Anything is possible. What isn’t possible is imagining him stopping. Byron McLaughlin was always a man who spent his life chasing and being chased by money, always calculating, always taking, and always, always running. John R. Schmertz Jr., et al, International Law Update, “Ninth Circuit Reverses Contempt Ruling,” October 1995, p. 9. I would say this guy really had off-field character issues. But what if he had been a better pitcher? Appreciating the persistence you situate keen on your locate and in strength information you provide. It’s fine to come crosswise a blog every once in a while that isn’t the matching outdated of date rehashed information. Wonderful read! I’ve saved your site and I’m including your RSS feeds to my Google account. M Thompson, my site exists for "a free flow of dialog and debate" among conservatives, which is why deadhead anonymous leftard commenters are not welcome. When one side of politics behaves no better than trolls, contributes nothing to a discussion and merely insults the host who owns the site, then they will continue to be banned.I've yet to meet a leftist who is genuinely interested in the free flow of dialog and debate, hence our comments policy. There are many players who have crossed over to the dark side. Jerry Koosman did time for tax evasion. Pete Rose did time. Ditto Denny Mclain. There are probably enough names fill out an impressive lineup card. Babe Ruth, troubled youth division. Yeah man; that's just itchin' to be inked. Looks great. I really like how exgkderatea/bulgy his thighs and torso is. It's very different to the slim-looking characters you usually draw. TimknutSkal lÃ¸pe full fart pÃ¥ 1 srm selv pÃ¥ onsdag regner jeg med. Det virka som noen skummelt bra intervaller det der! . MEN, jeg slo deg med 1 sekund pÃ¥ raskeste 400 meter Vi hadde aaaaltfor lange pauser da. 2-3 minutter. Uansett. 1:09 er gjeldene raskeste 400 meter?Sees pÃ¥ onsdag. Todos témola penitencia nesta terra, mais a túa coa “señora da Cope” non cha quero eu para min. A mágoa e que para ver o “Hai debate” e que témola que aturar a ela.Sorte. Ca vole pas haut, ce tie-break… Les deux joueurs incapables de profiter de leurs opportunitÃ©s.Berdych l’empoche finalement. Merci la grosse faute d’Andy en coup droit alors qu’il Ã©tait revenu Ã 5-5 on ne sait pas trop comment. 48% de 1Ã¨res balles seulement pour le scottisch dans ce set. 9 winners pour 16 UE, dont 2 double fautes. Bref, c’est pas le meilleur Murray sur ce set. En face, Berdych est agressif.Le 3Ã¨me set sera intÃ©ressant. One thing is that when you find yourself searching for a student loan you may find that you’ll want a co-signer. There are many cases where this is correct because you will find that you do not employ a past credit history so the bank will require that you have someone cosign the loan for you. Thanks for your post. Thank you so much for posting this!! My DVD’s are finally going in for pressing today! I hope you’ll get a chance to enjoy them… Best Wishes, David ps hope our paths will cross one day soon! C’est un vidÃ©o extraordinaire ,ic’est Ã©mouvant de dÃ©couvrir nos enfants dans ce rÃ©cit en photos du dÃ©but de leur amour.Les photos sont superbes et le montage magnifique.FÃ©licitations! La maman du mariÃ© . I think they do because even though it’s a parody, he says a lot of “what I’m really thinking, but can’t really get away with saying” stuff, so it sort of cathartic. Why not Truthiness Toffee? @ Dennis – Todd Cruz and Mark Lemongello come to mind, as well. And, of course, Ron LeFlore and Gates Brown served their prison time before their playing days. Nice article, Patrick. Have to admit my favorites of your work are the sympathetic obscure players, but sociopaths need a little love too. As I sit here and wrap it up for the day, I recall Cesar Cedeno getting arrested in a hotel room in Puerto Rico in the early 70’s for shooting a woman. Don’t know if he ever did time but he was never the same after that. Are there many ex-Major League players whose current whereabouts are unknown?